The Bosphorus Bridge in Istanbul is one of three continent-spanning bridges over the Bosphorus Strait, connecting Europe and Asia. When it opened in 1973, the 5,118-foot (1,560-meter) bridge was the fourth-longest suspension bridge in the world. And though it has since slid down the rankings, it is still an impressive sight to behold. The Bosphorus Bridge, officially known as 15 July Martyrs’ Bridge, is only open to vehicles. The bridge can be seen from Ortaköy Mosque on Istanbul’s European side and from Beylerbeyi Palace, an imperial Ottoman summer retreat, on its Asian side. 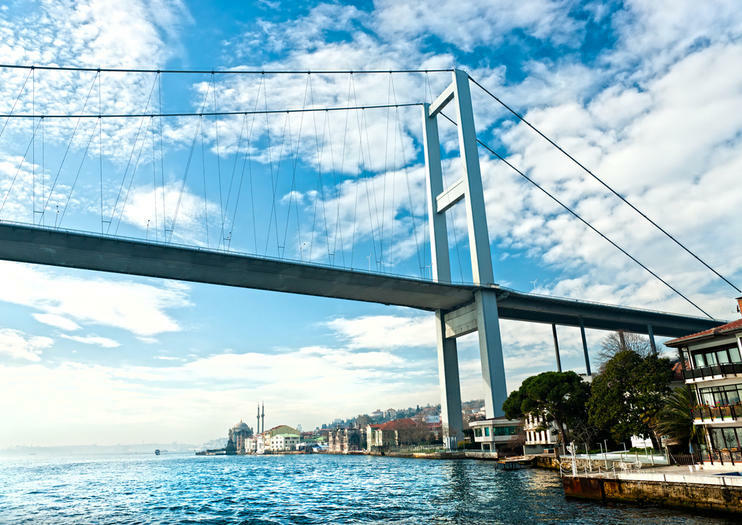 The best way for visitors to view the bridge is to take a Bosphorus cruise. Many cruises begin at the Golden Horn, from which you can see the minarets of the Blue Mosque and Hagia Sophia before venturing into the Bosphorus Strait, cruising past Dolmabahçe Palace and under the bridge. Some cruises include lunch or dinner on board. The Bosphorus Bridge is an emblem of Istanbul and one of the Turkish city’s most photo-worthy sights. While you can admire the bridge from land, be aware you can’t cross it on foot. Note that it is a toll bridge and tolls can’t be paid with cash or card. If you are driving in a rental car, make sure it is equipped with a toll transponder. To reach the Ortaköy side of the bridge from Sultanahmet, take the T1 tram to Kabatas, where you can connect to Ortaköy using local buses or taxi. Alternatively, take the ferry from Eminönü to Ortaköy; note that ferries don’t run on Sundays. To get to Beylerbeyi Palace on the Asian side, take the ferry from Eminönü to Üsküdar, then connect to local Beylerbeyi Palace–bound buses. One of the best times to view the bridge is at night, when the structure is lit by colorful LED lights. If you want to cross the bridge on foot, sign up for the Istanbul Marathon—Turkey’s biggest marathon—which usually takes place in November. The marathon route crosses over the bridge, and this is the only time pedestrians are allowed. For excellent views of the bridge, head to Ortaköy, a former fishing village turned chic Istanbul suburb on the European side of the Bosphorus. Explore the area around Ortaköy Pier, which offers particularly good views of the baroque-style Ortaköy Mosque with the modern bridge in the background, showing off Istanbul’s old-meets-modern cityscape.